Under pressure from the music labels and Apple Music, Billboard magazine is ending its practice of giving equal weight to paid streams and free streams in its music charts. Currently a single that is bought from Apple’s download store or streamed on its paid subscription service is viewed the same as a free stream on YouTube for the purposes of Billboard’s “Hot 100.” Next year, Billboard said it will prioritize paid streams, meaning artists might be more inclined to promote their songs on paid services such as Apple's to boost their chances of rising up the charts. The decision is a blow to Google’s YouTube, which had hoped to broaden its representation and was in talks with Billboard about being included in the album charts. YouTube has a gigantic free ad-supported video streaming business. Billboard said late Thursday on its website that it is retooling the formulation of its charts, which are compiled by Nielsen Music. “Beginning in 2018, plays occurring on paid subscription-based music services (such as Amazon Music and Apple Music) or on the paid subscription tiers of hybrid paid/ad supported platforms (such as SoundCloud and Spotify) will be given more weight in chart calculations than those plays on pure ad-supported services (such as YouTube) or on the non-paid tiers of hybrid paid/ad-supported services," Billboard said. The statement went on the clarify that video streams would not count into the album chart calculations. Jimmy Iovine, who is head of Apple Music, has been arguing against YouTube growing its influence. He told NBC News that artists say they work with YouTube to promote their records because it currently counts the same as a paid stream. “How can the record industry let that go down? It is not in their interest to promote a free tier.” He also described YouTube as “fake news,” meaning that its traffic is open to manipulation. Iovine said he’s been in discussion with Billboard on the topic and says the music industry should be all pulling in the same direction, supporting ways of getting artists paid. The music labels receive a much bigger cut from paid streaming services than they do from YouTube’s advertising. Independent labels have also been agitating for change. YouTube didn't return several emails for comment. The Billboard charts receive enormous press and give artists and their teams a big ego boost that goes with a top position. 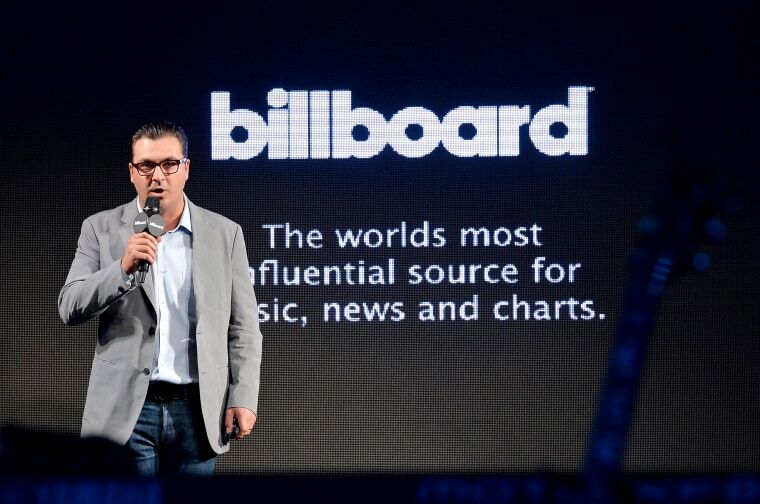 Billboard, owned by Eldridge Industries, which also houses Hollywood Reporter, blends music sales with consumption via the radio, Apple Music and many other outlets to generate its rankings. But the company explained in its statement on Thursday that it has to juggle the changing ways of listening to music to reflect popularity. Music label executives are already irked by YouTube streams inclusion in the Billboard’s singles chart, “The Hot 100.” These executives point out how easy it is to increase traffic via bots and that YouTube decides what to serve up to users after they select a video. YouTube requires no login information, making it extremely easy to access. There is however no evidence that anyone has manipulated views on YouTube, though Google has admitted to fake traffic in some parts of its ad network. To give some idea of the scope of YouTube’s influence on music, Luis Fonsi’s “Despacito,” hit one billion streams worldwide within 100 days of the song’s release. In October, it hit four billion streams making it the most streamed song of all time. The song spent a record 16 weeks at number one in the summer. On the front line of the pitch for Google is Lyor Cohen, YouTube’s global head of music. Cohen is a well-known figure to the labels. He is a former CEO of Warner Music's recorded music division before going on to launch his own music label, called 300, with Google's financial backing. He and Iovine were once fierce rivals in the world of rap music. In the '90s, Cohen ran the record label Def Jam and Iovine was co-founder of Interscope Records. The backdrop of the charts conflict is a long-running dispute between the music labels and YouTube over payment for music played there. The music labels are arguing in Brussels in front of the European Commission and at the U.S. Copyright Office for a change in the provisions of the 1998 Digital Millennium Copyright Act, which essentially gives tech platforms protection from legal action for distributing illegal content. It was enacted to help protect the growth of the internet — largely AOL at the time — and well before anyone envisaged a YouTube with a billion views per month. Of the three big global music companies, only Warner Music Group has struck a new license with Google for use of its music this year. And even then it complained loudly about its poor deal, after the fact. Universal Music Group and Sony Music Group are still haggling about a fairer cut of revenue from songs played on YouTube, with or without a license. YouTube has argued that its system identifies most violations and in turn has helped create a huge new revenue stream for the music labels. Officials at the three music labels didn't comment. CORRECTION (Oct. 21, 2017, 12:05 p.m.): A previous version of this article misstated the company that owns Billboard and The Hollywood Reporter. Eldridge Industries owns the magazines, not Prometheus Global Media.